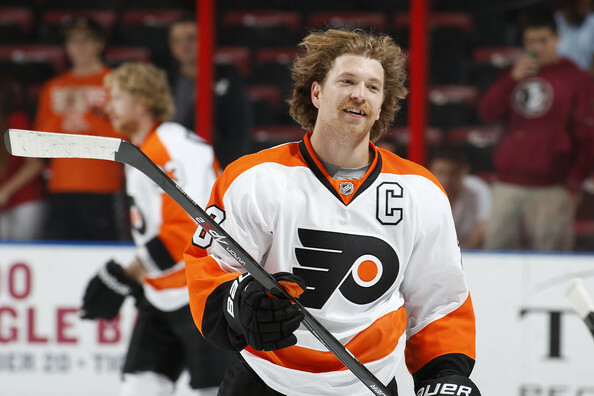 Claude Giroux and the Flyers are currently in a playoff spot despite having one fewer win than the Red Wings. Enough is enough. In fact, it’s been enough for some time now. When the NHL suffered a lockout for the 2004-05 season, it implemented shootouts when it returned. When it almost lost the 2012-13 season, it didn’t change a thing. Overtime is now 3-on-3, a fun change for fans, but one thing is still ruining the game: the point system. Why does the league reward a team for simply not losing in regulation? There was a time when the point system sort of made sense – when games ended in ties, since ties in professional sports are silly (yes, this includes you, NFL). Now, it makes absolutely no sense. Furthermore, it seems that more and more teams are suffering at the hands of a team with an inferior record. Last season, the Columbus Blue Jackets were on the outside looking in. They finished with a record of 42-35-5 — and let’s call a spade a spade and get rid of the “overtime losses,” they were 42-40 — yet missed the postseason with 89 points. Conversely, the Boston Bruins, who also missed out, were alive on the season’s final day despite finishing 41-27-14 (41-41). Columbus also finished behind the Florida Panthers, despite Florida being just 38-43. This season, the Detroit Red Wings’ 24-year playoff run is in jeopardy as they battle with the Philadelphia Flyers. Were the postseason to start today, the Red Wings would be out. However, they have one more win (in one more game) than Philadelphia, with a 36-37 to the Flyers’ 35-37 mark. How can that be? The list goes on and on. Really, there are too many to count, but for good measure we’ll add in the 2013 Winnipeg Jets, who like the New York Islanders were 24-24. But because seven of New York’s losses were in OT compared to just three for Winnipeg, the Jets watched the postseason from home. In theory, you could argue that if we keep the anti-climactic shootout, then getting through overtime is worth a point, even if you lose in a shootout. Even then it’s debatable, but why are we rewarding a team for simply not losing in 60 minutes of hockey? And why are teams with more wins left out in the cold just because their rivals saved more of their losses for after regulation? Be the first to comment on "Please Abolish the NHL Point System"